One of the birds that was new to me here was the Pine Warbler. A guidebook description mentioned that they were often seen with Eastern Bluebirds, and that helped me make the ID. 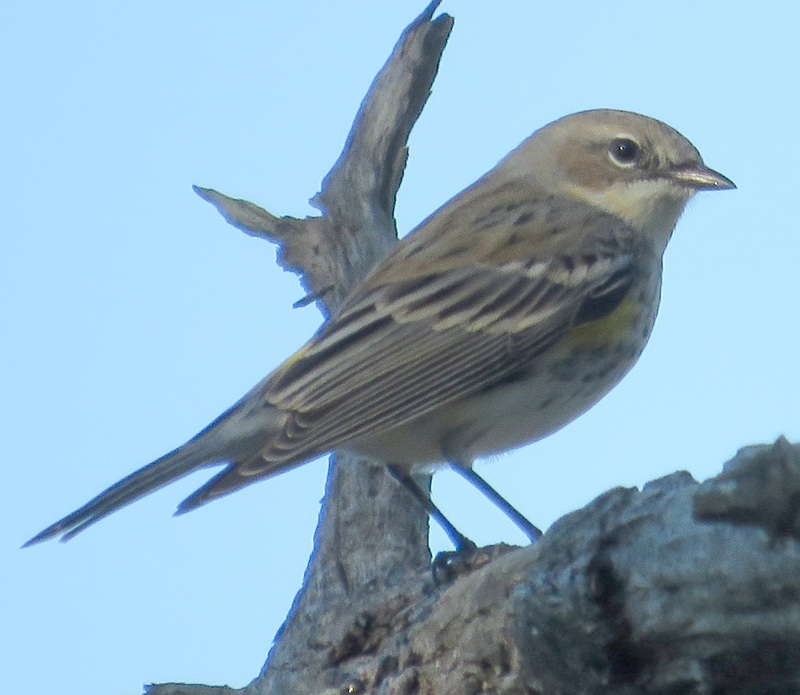 But then, it took me a few years to realize that not every small yellow bird around here is a Pine Warbler. Only one of these birds is actually a Pine Warbler. 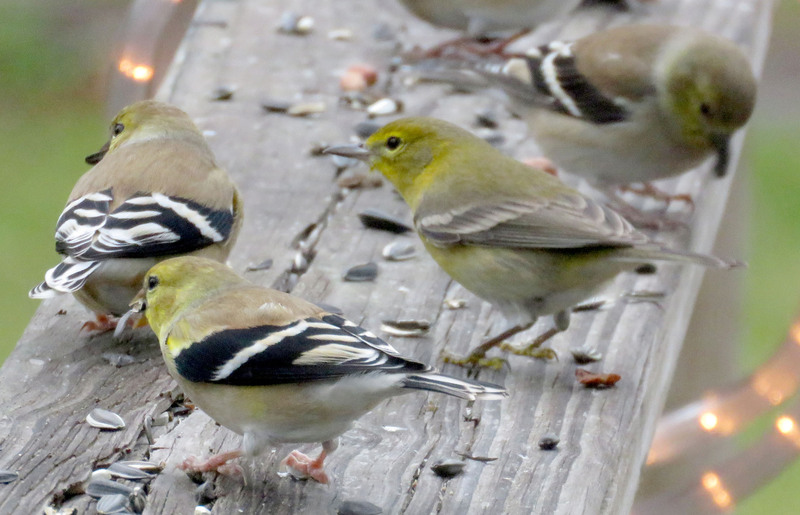 The other three, with the strong black and white bars on their wings, are American Goldfinches in winter plumage. I knew them by sight when I lived in Sugar Land, but here, it took me a few years to even notice them and realize they were different. 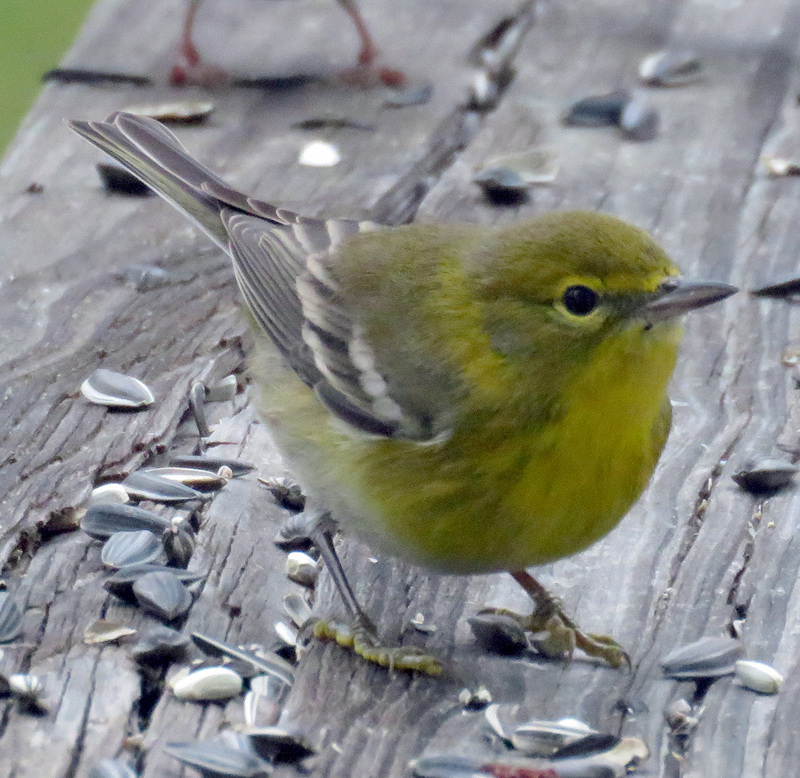 The Pine Warbler has a longer, thinner bill, duller wings, and olive-ish legs. It’s easy to get clear pictures of the birds when they come in for birdseed, but when they are in the woods, it’s hard to get a good shot. Periodically I would get pictures of “Pine Warblers” that just didn’t look right – instead of standing up nice and straight, they would be bending and stretching in a way I never saw at the feeder. They looked sleeker than usual. Every year I would just file those pictures in my “mystery bird” folder. After years of trying, I got one picture with no branch in the way, but the bird was on the shady side of the tree. You can just barely see the yellow spot on its back. Surveys routinely show it as one of the fastest-growing outdoor activities, and depending on who’s counting, the number of birders has been pegged as high as 67.8 million Americans — which is almost certainly bogus, give that such surveys count as a birder anyone who tosses sunflower seeds for the juncos. The U. S. Fish and Wildlife Service, which also takes a liberal definition of “birder,” put the number at 46 million, with 24 million making trips away from home to watch wild birds. Measuring myself against this standard, my first thought was that of course I could identify 100 species. It took me a long time to learn the birds here but now I can ID most of them automatically. But I realized I can only identify my “homebirds,” and sometimes not even those. Weidensaul’s point here is not to judge who should or should not call themselves a birder; he is trying to determine a baseline, from which to expand both the breadth of participation and the depth of knowledge among birders. But for me it was an interesting way of assessing my current level of birding knowledge. Weidensaul talks about two schools of birding – the “lister” who is more interested in just checking off species, and the “ornithologist” who studies birds in greater depth. For myself, basic ID has to come first. I have to know what is on the list before I can study its life. I don’t mind being a bit slow at picking up the nuances of birding. An easy identification OR the sudden correction of a previous mistake gives me the same happy feeling of things clicking into place. Nice photos and interesting thoughts about birding and birders. Thanks! This time of year should be calm and quiet and allow me to post, but things have been keeping me busy. I hope to get back more regularly. I hope all your water problems are solved! A great post, Ms. Ranger–and photos to match. 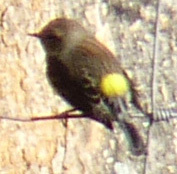 This seems to be the year-of-the-yellow-rump. I’ve never seen one before and I now have three that are daily, or nearly daily, visitors. I know some other folks here in Austin who’d never seen them before either. Or else, we just just thought they were sparrows. I’m also fairly sure that I had a pine warbler this past weekend, though I think I’m supposed to be a bit too far west.